Dear PCI friends i never thought that i will have the patience to type down so much but after seeing all the others doing something similar i had to do something. This trip was taken in October 2013 and it was memorable in many ways. Please download the PDF version of the trip report and enjoy. Nice series and superb write up Subhadip! Brilliant write-up and amazing pics...i think only you could have combined both so well. It was a Saturday 5th of October me and my colleague Prosanto was discussing about our photography as a hobby. Durga Puja vacations are long in Bengal often lasting 5 ? 6 day thus we were contemplating if we could make an impromptu plan to go for a short photography trip somewhere near. Fortunately for us both our spouse and our children were going to their in laws place thus we were completely free for few days. The challenge was that we were really late and during Durga Puja almost all train tickets are booked and travelling to any destination can be a challenge. So instead of the destination we started looking at IRCTC website for available train tickets from Kolkata to any destination. Unfortunately the WL was way too much. It was then it struck me that we could easily break our journey and arrive at our destination so now we have freeze on the destination. After much deliberation we fixed on Varanasi. Reason well?. 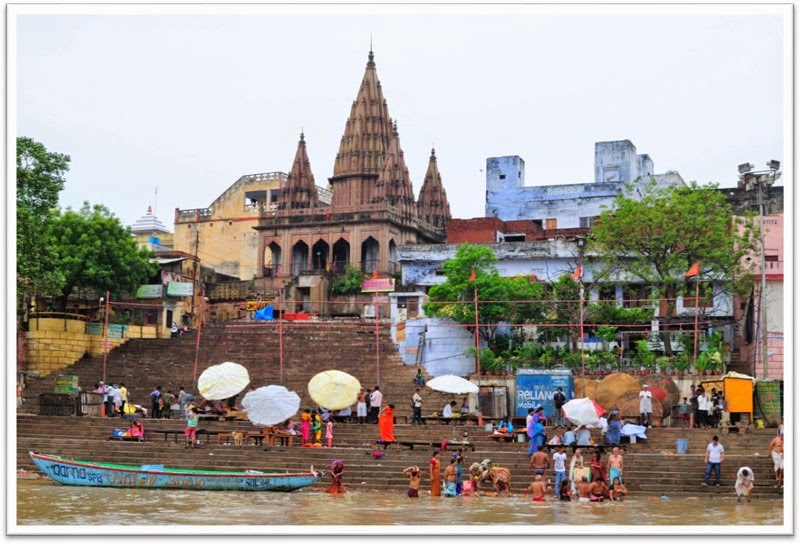 do we really need a reason for Varanasi. It?s like a magic pot and surely we will find many things to click. 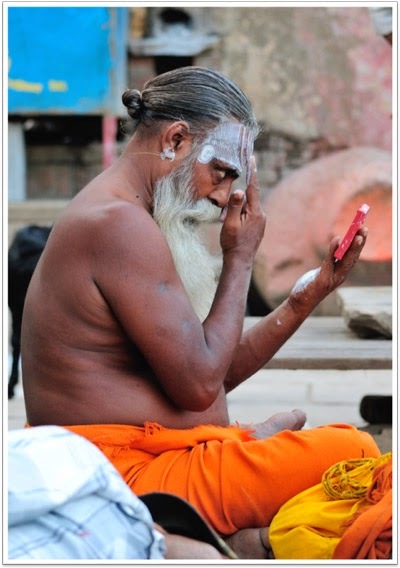 So Varanasi it was?. In the meantime another junior colleague of us Dinesh broke into our conversation and showed interest to join us in our adventure. This proved good since this would mean cost cut as the share will be always for three. So now we started searching tickets for Vanarani. 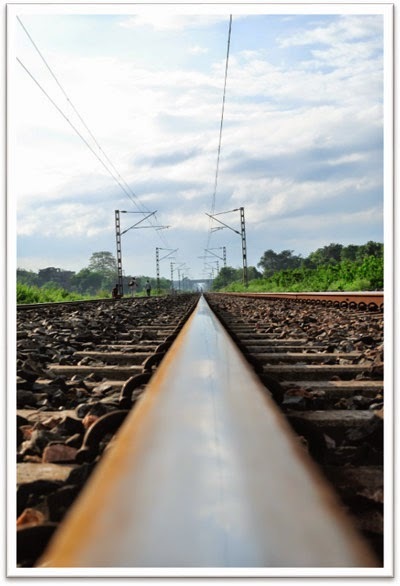 Our best bet was to travel to Asansol Jn and then take the Asansol to Ahmedabad Express train. This train goes via Mughal Sarai Jn and then we will take an auto to Varanasi city. Now we have to go Kolkata ? Asansol ? Mughal Sarai ? 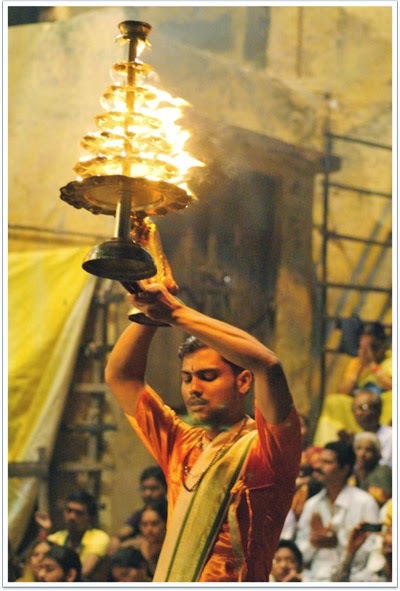 Varanasi. Luckily the above plan worked and we found tickets*from Kolkata to Asansol and then from Asansol to Mughal Sarai. 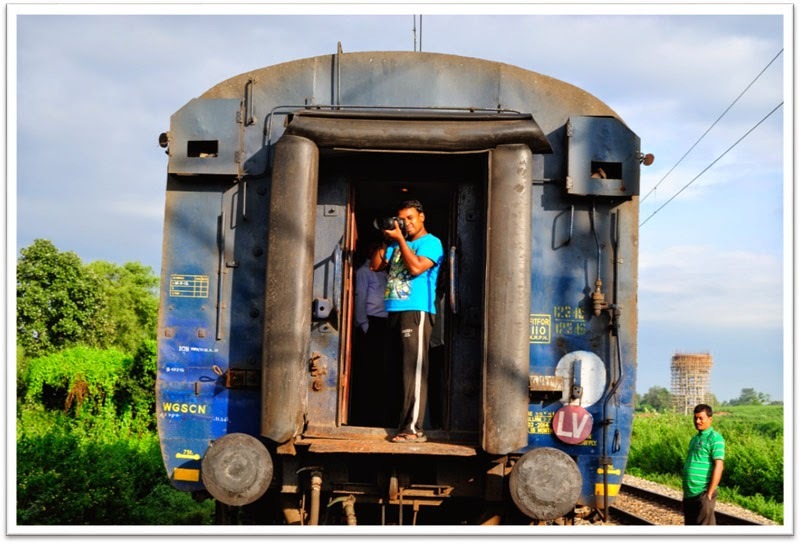 This was a budget travel thus we opted for Sleeper Class. Adventure 1: It was DP (Durga Puja) thus the traffic was at its worse as it took nearly 1 hour to reach the station. On reaching the station we called up Dinesh to ask where he was and to our horror he had just left his house and we knew it was almost impossible to reach the station in time. So we kept calling him after every 5 minutes but his taxi was stuck in traffic jam. By now it was 10.30 AM and still the taxi was far away. Next was complete bizarre?.. Dinesh offered the Taxi driver 100 Rs extra and asked him to go through one way and also go through no entry barriers. The taxi driver agreed and asked Dinesh to lie on the back of the seat and act like a patient requiring urgent medical help. The taxi drive started waving his red cleaning cloth and slammed on the accelerator. He reached station at 10.55 and ran to the platform. The train departed exactly at 11.00 AM and the journey started. Lucky for us Dinesh got Alu Parathas from his home for lunch and he was considerate enough to include us. So the first lunch we had Alu Parathas followed by Bananas from train vendor. We reached Asansol Jn at around 4 PM and went straight to the waiting hall. Our connecting train to Mughal Sarai Jn was at 10.00 PM. Nothing much to do we roamed around the city outside the station and munched on some Samosas followed by Hot Rasgullas from street vendor for evening snacks. At 8 PM we went straight to the station rail canteen and purchased our meal voucher. For 120 Rs we got Non Veg Thali (Chicken, Daal, Mixed Vegetables and Rice). Finished our dinner and went straight to the platform and boarded our next train to Mughal Sarai. The train was scheduled to reach Mughal Sarai at 3 AM next day so we went straight into sleep mode. We set our mobile alarm to 2.45 AM. Sleep did not come quick as we kept talking and planning for the next day. After 1 ? 2 hours of sleep my alarm started first and I hurriedly got of my bunk. The train was not moving and I assumed it was stuck somewhere. I went to the wash basin to splash water on my face to cut the sleep out. To my horror I see that the train was actually halted at a station and when I looked out my heart froze. The train was at Mughal Sarai Jn already. I rushed back and switched the lights on and woke up Prosanto and Dinesh. They jumped out and within 1 minute flat we were out of the compartment. Once outside the station we were bit out of our bearings and confused which way the auto stand was. Luckily another fellow passenger a student going to BHU (Benaras Hindu University) showed us the auto stand. 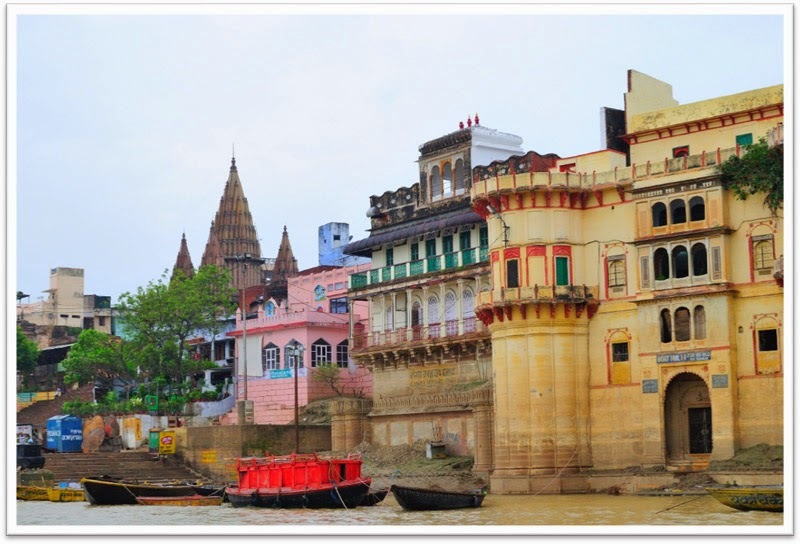 We quickly negotiated for Rs.180 to Varanasi Cant. It was a quick ride and took just 20 odd minutes and we reached Varanasi Cant by 3.20 AM. From Varansi Cant we took another auto to BHU main gate (Lanka Gate). It was a shared auto and took20 Rs per head. On reaching Lanka Gate we offered additional 50 RS to take us to Assi Ghat since out guest house was located very near to it. We reached Assi Ghat at around 3.40 AM and comes another shock. The entire locality was blocked as a movie shoot was going on. They were shooting for a movie called ?Gangs of Varanasi?. Unfortunately the lane that we had to take towards our guest house was blocked as a fight sequence was being shot. We had no option but to wait so we decided to wait it out at the Ghaats of Assi. The Ghaat was at its very best that morning. 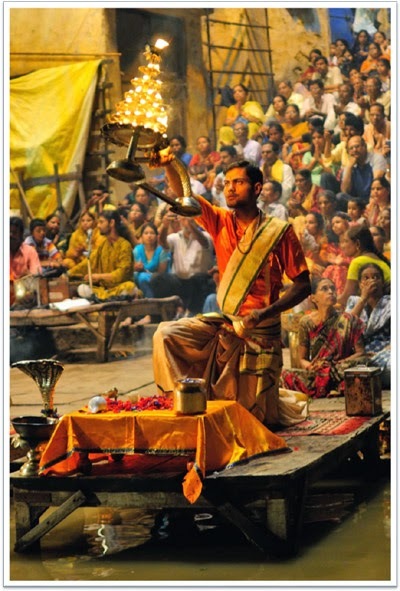 I have been to Varanasi nearly half a dozen times but never a scene like this. 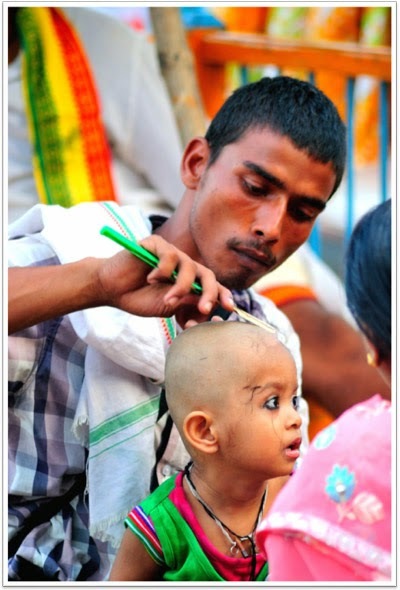 It was the morning of Saptami Durga Puja and the local priests were performing a special puja. 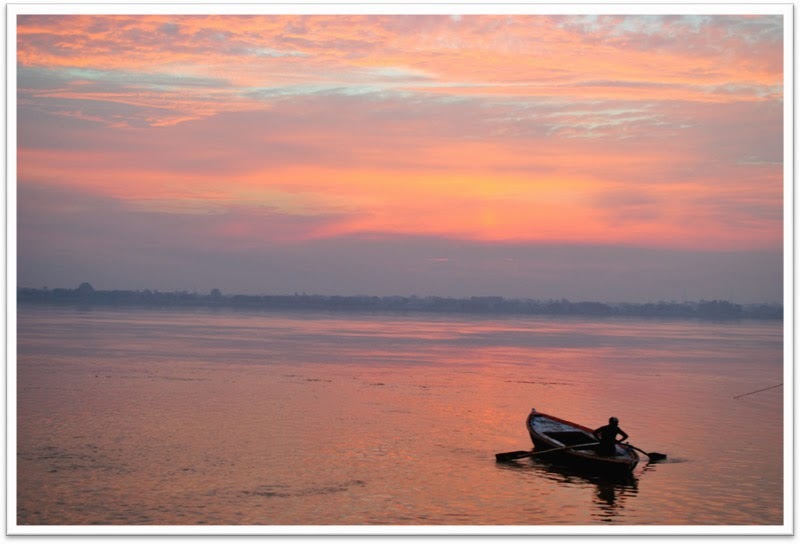 With dawn just breaking on the Ganges had a mystical feel. We quickly took out cameras and started to shoot. Luckily I had my new Nikkor 35 mm 1.8 G and in the low light situation it proved to be a killer. By 6 AM the shoot was over and we were ready to head towards the guest house. We had booked at Kesher Guest House over phone and at 800 Rs per night for a double bedded room*we were bit unsure of the quality and the facility that we were about to get. Then we sat and planned for the day. We will head to Sarnath first and then to Dasaswmedh Ghaat to see the evening aarti. We ate Puri Sabzi for breakfast @ 20 Rs. Per person and booked an Auto for Sarnath for 200 Rs. By this time Varanasi was at it full swing; cows, bicycle, hippies, foreigners, sadhus were all out on the street and it was like a hell navigating through them. It took nearly an hour to reach Sarnath and we quickly purchased the ASI ticket to enter . Photography tickets are extra and we paid 250 Rs for tripod charges along with video camera. 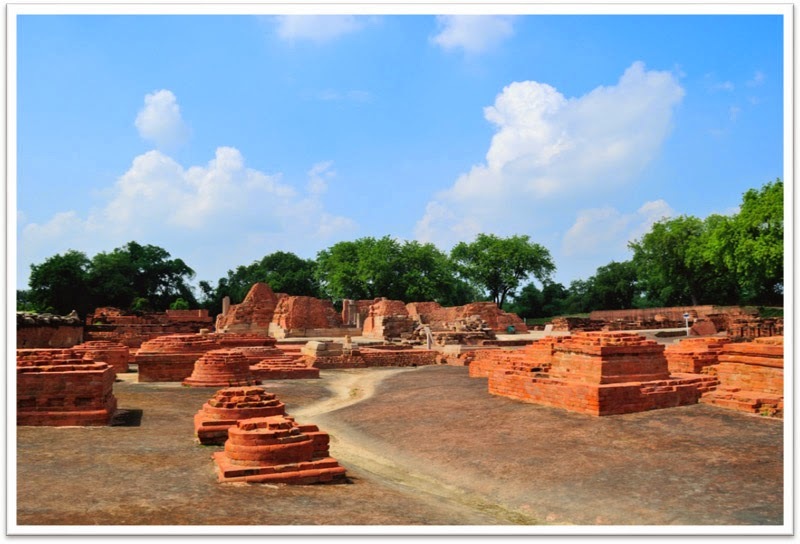 Sarnath is a city located 13 kilometres north-east of Varanasi near the confluence of the Ganges and the Gomati rivers in Uttar Pradesh, India. 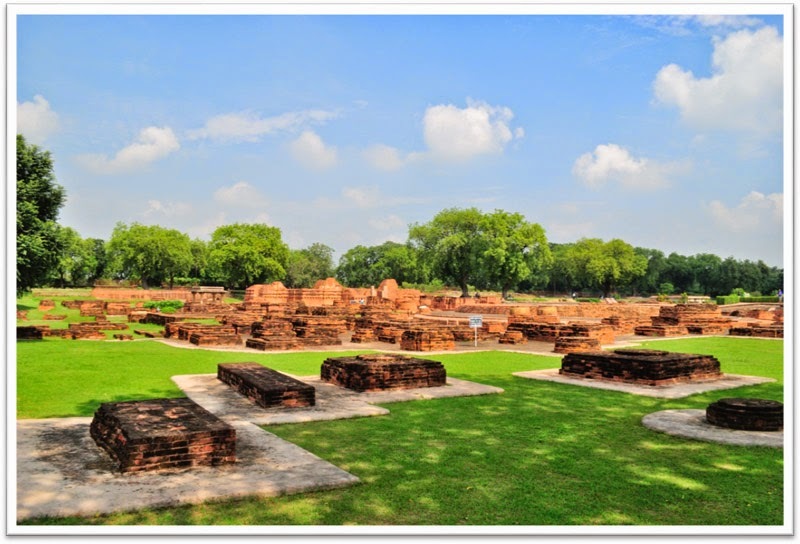 The deer park in Sarnath is where Gautama Buddha first taught the Dharma, and where the Buddhist Sangha came into existence through the enlightenment of Kondanna. 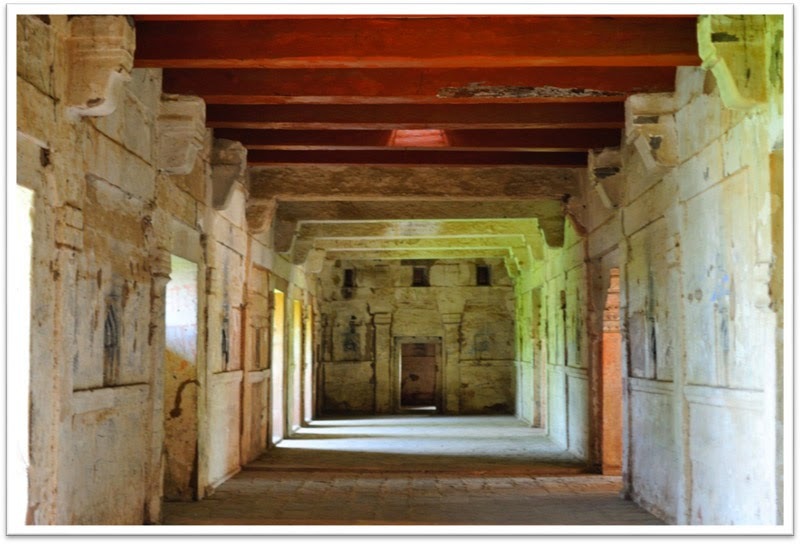 Singhpur, a village approximately one km away from the site, was the birthplace of Shreyansanath, the eleventh Tirthankara of Jainism, and a temple dedicated to him, is an important pilgrimage site. 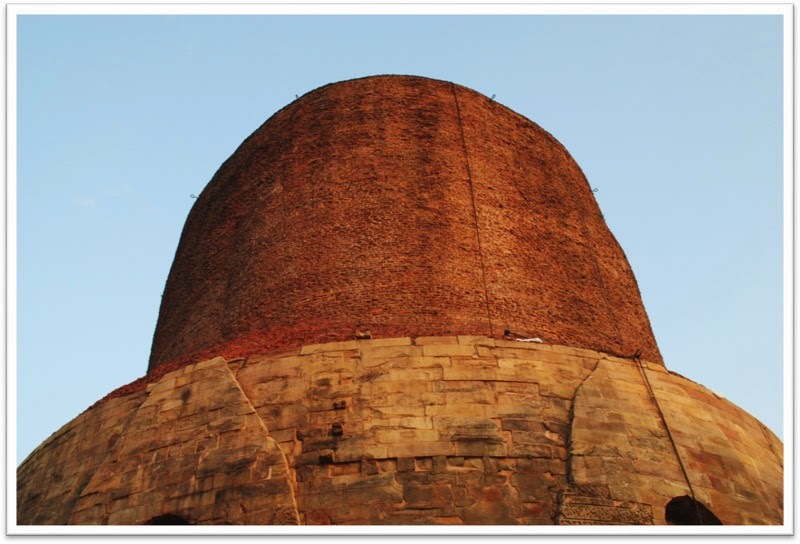 Buddha went from Bodh Gaya to Sarnath about 5 weeks after his enlightenment. Before Gautama (the Buddha-to-be) attained enlightenment, he gave up his austere penances and his friends, the Pa?cavaggiya monks, left him and went to Isipatana.After attaining Enlightenment the Buddha, leaving Uruvela, travelled to the Isipatana to join and teach them. He went to them because, using his spiritual powers, he had seen that his five former companions would be able to understand Dharma quickly. While travelling to Sarnath, Gautama Buddha had to cross the Ganges. 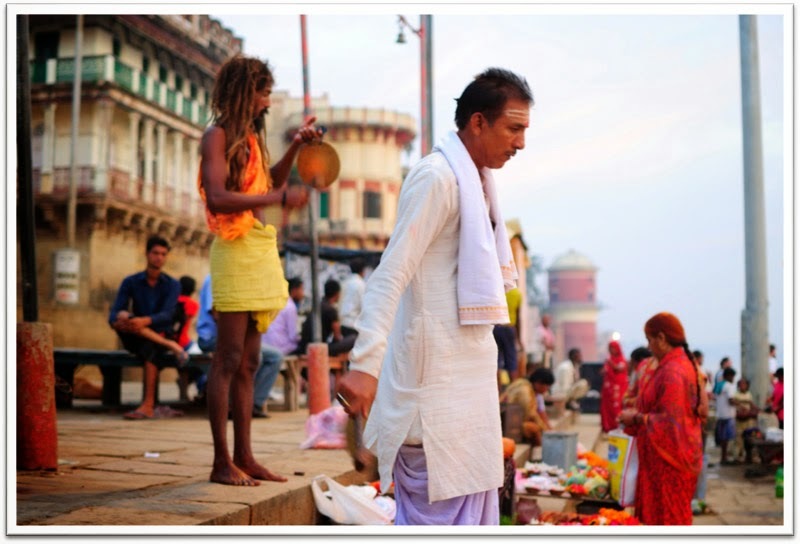 Having no money with which to pay the ferryman, he crossed the Ganges through the air. 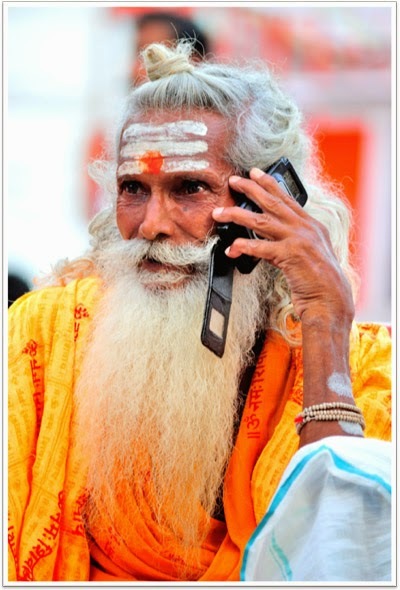 When King Bimbisāra heard of this, he abolished the toll for ascetics. When Gautama Buddha found his five former companions, he taught them, they understood and as a result they also became enlightened. We took the auto back to Lanka Gate and had sumptuous lunch. It was Veg Thali for 80 Rs, Varanasi has mostly veg restaurants but there are some very good non veg restaurants also. Post lunch we went to Pahalwan?s Lassi shop which according the locals are legendary for their taste and quality. Now here is the trick part when we reach the spot we see nearly a dozen shop with the same name. As usual in India the sons of the original Pahalwan split up and opened their own shops. Anyways the taste was not that spectacular but good enough. We took a Cycle Rickshaw to Dasaswamedh Ghat for 20 Rs from Lanka Gate. 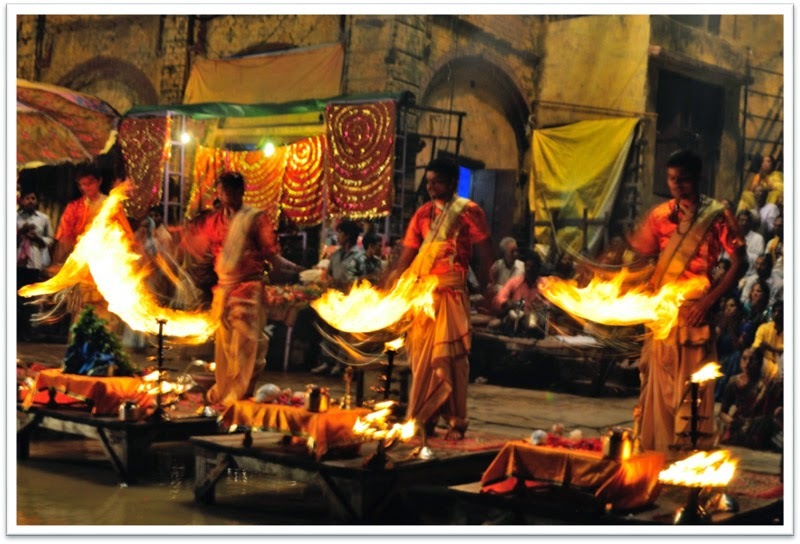 This being the main ghaat was the main attraction for any one coming to Varanasi. This place was like India compressed into one square kilometre. There was monkey, priest, foreigners, young, old, Chillum addicts you name it and they were all there. No sooner we enter the ghaat area it was photo opp all the way. Click click our cameras started clicking at every direction. By evening we paid 20 Rs. Per head to a boat so that we could have a front row view of the evening aarti. The aarti as usual was very photogenic and our cameras started shooting every second. 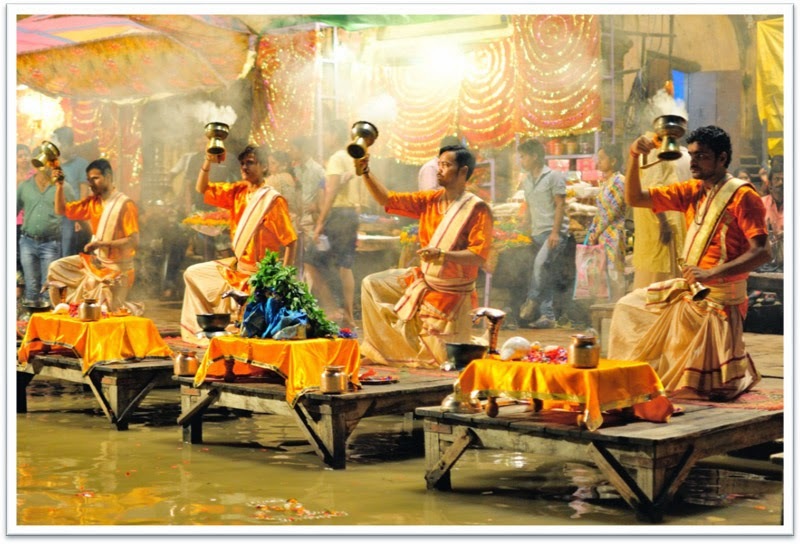 This year the water level was quite high and the aarti was performed on the stairs instead of the large platform. We head back after the aarti and on the way had good dinner at Lanka gate. Rs. 120 for a Chicken dinner was sumptuous and being tiered we gobbled it down and headed back to our guest house. Surprisingly even after less sleep and so much of travelling we still had the energy to sit in the terrace and discuss the day. It was nearly 1 AM that we went to sleep. It was 12th October? we got up at 4.30 AM and went to the ghaats since we wanted to see the Ashtami Puja. It was nice and beautiful morning and there were many house wives performing pujas. We went back to our guest house at around 6 AM and freshen up and ready to go to Chunar Garh to check out Chunaar Fort. We went to Lanka Gate and had hot Puri Sabzi along with Raajbhoog. We took a shared auto from Lanka Gate to Ramnagar Moore which costed us 20 Rs per head. From there we took a bus to Chunar Garh. Bust ticket cost was 30 Rs per head and took nearly 1 hour to reach Chunar Garh bust stop. It was a fifteen minute walk from the bus stop to the Chunar train station where we need to take an auto. The sun was up and we fell the full heat. This part of the country is quite dry and dusty and we walked along the train tracks. From the station we reserved and auto for 100 Rs. The auto will take us to the fort and will wait for us and drop us back to the station. Now let me describe this auto to you. This auto was probably the first generation of Bajaj Auto and the highest speed was around 10 Km per hour. The engine noise was almost deafening and took nearly 20 minutes to reach the fort gate. 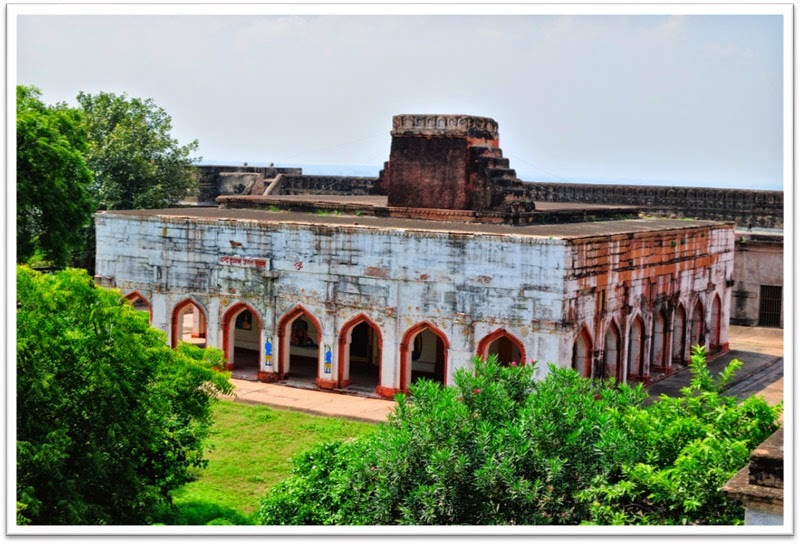 The Chunar Fort (also known as Chandrakanta Chunargarh and Charanadri) is located in Mirzapur district of Uttar Pradesh, in India. 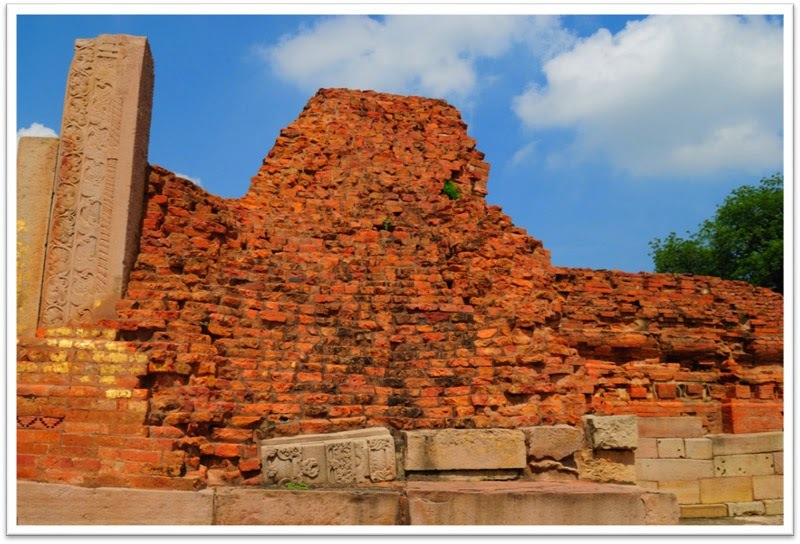 Along with Chunar town, situated below the fort, the two are historic places with common history and legends. 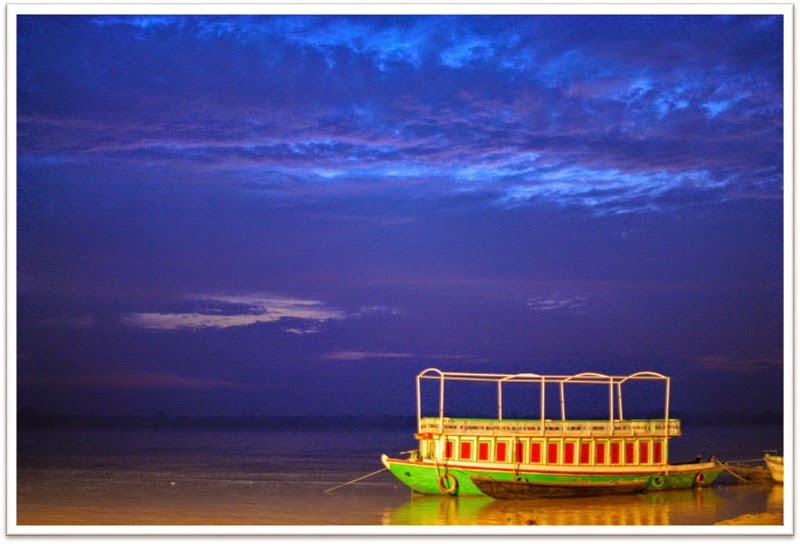 It is located 14 miles (23 km) south west of Varanasi. The southeastern part of the fort is on the rocky bank of the Ganges River. 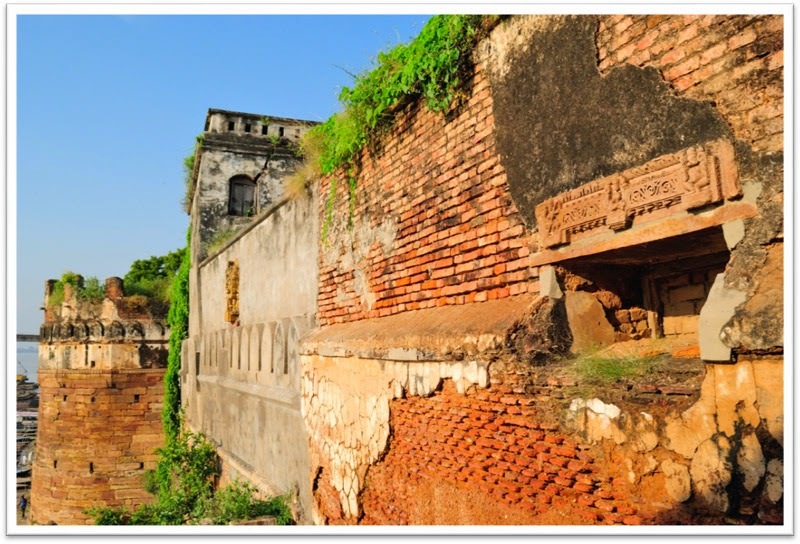 The fort's history spans from 56 BC and then between Afghan decedent Sher Shah Suri's (1532) rule, the Mughal Empire rule (Humayun, Akbar and many others including Nawab of Awadh) up to 1772, and finally the British Raj up to 1947 till India gained independence. There are many legends linking the fort to divine aspects. One such is the story of King Bali. God, known in these parts as Bawan Bhagwan, appeared before Bali, disguised as a Brahmin, and begged for three feet of land. The generous king agreed. 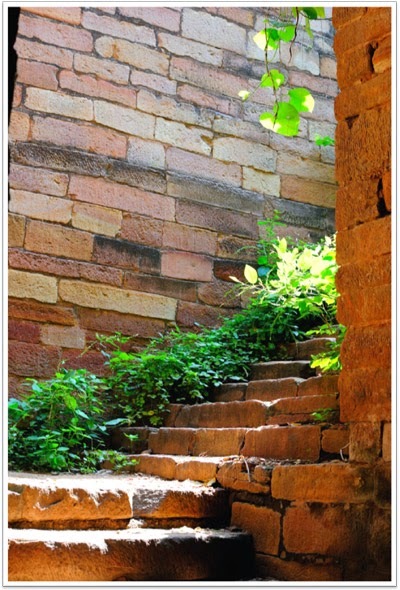 God placed his first step on the hill of Chunar Fort and left his foot mark there. 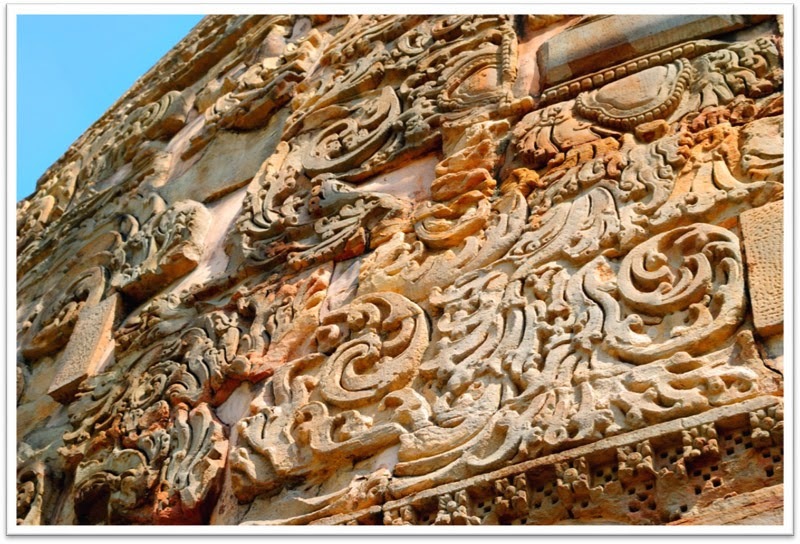 Since then it is known as ?Charanadri?, which over the years took the short form of ?Chunar?. captured Bengal), a highly ambitious Pathan of Afghan descent but born in India, took control of the fort with high ambitions of becoming the King in Delhi. 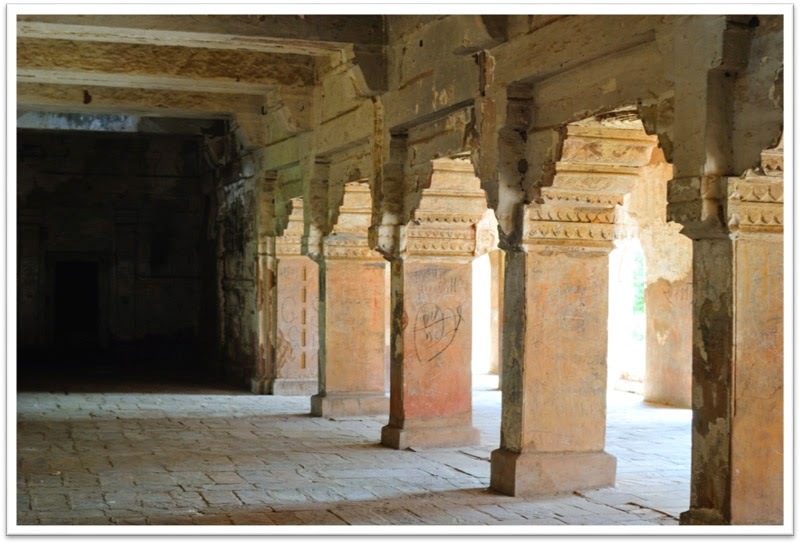 He acquired Chunar Fort by strategic marriages to enhance his reputation, first with a childless widow (the wife of the deceased Governor of Chunar),and by marrying another widow, he acquired wealth. With these acquisitions, he became very powerful within four years and established a "state within a state". 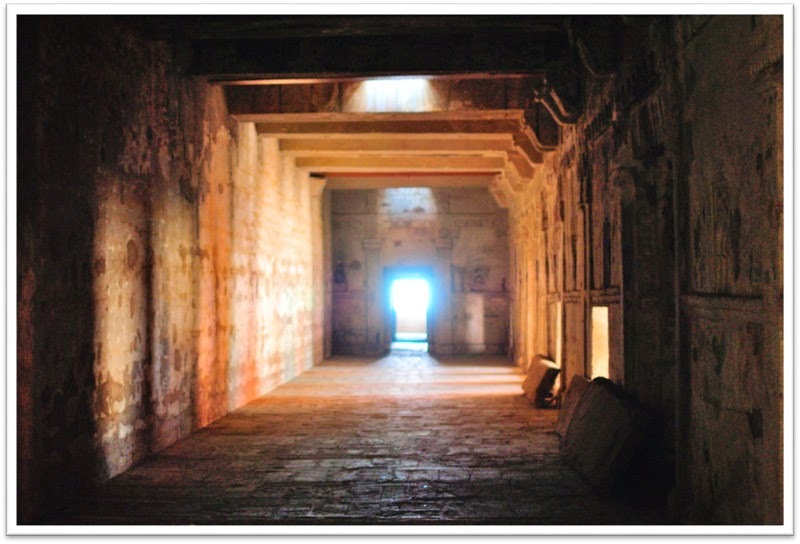 It is also said that the fort was not vital for Sher Khan as he had moved his harem and treasure to Rohtas (a newly won fort in the upper reaches of Son River) during his campaign to win Bengal. When Emperor Humayun attacked the fort and held it in siege for four months, he had proposed to Sher Khan that he would not claim Chunar and Jaunpur and any other place of his choice, provided he gave up Bengal, which Sher Khan had won. Humayun also demanded from Suri the surrender of his treasure which he had taken to Bengal and a precious (chattar) umbrella and throne, and also to agree to be under the protection of the Mughal Empire. Akbar, the Mughal Emperor had visited Chunar for shikar (hunting) in 1575 and captured the fort. He acquired it as he considered the fort strategically located to guard the Ganges and the major land routes to eastern India. Abul al Fazl described this victory over the fort by Akbar an important event. 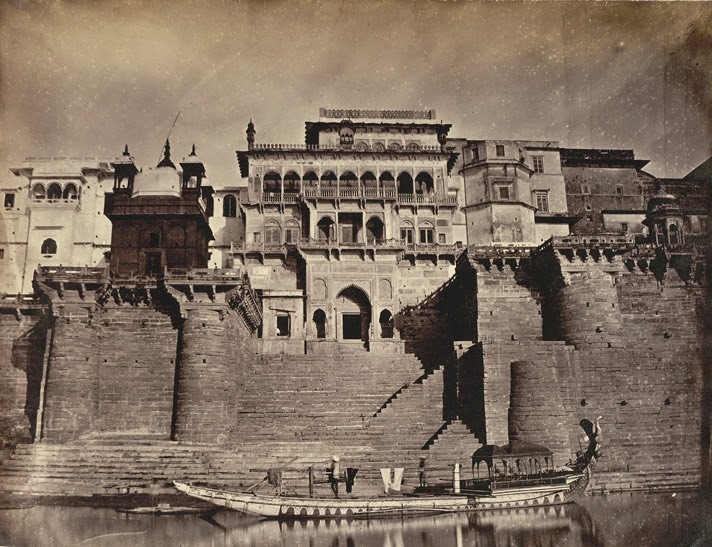 It is believed that much of the fort as seen now was built during Akbar's reign.During his rule, the west gate was built in the fort entrance, with the date 1586 having been engraved on the stone archway. During the Mughal rule, Emperor Jahangir had nominated Iftikhar Khan as the fort's nazim. During the reign of Emperor Aurangzeb, his appointee for Governor of the fort, Mirza Bairam Khan, constructed a mosque here in 1663, near the Bharion Burj.In 1760, following invasion by Ahmad Shah Durrani, the fort was captured by the troops of the Nawab. The British East India Company, under Major Munro, attacked the fort; though initially they lost ground, they subsequently breached the south west part of the fort and annexed it. 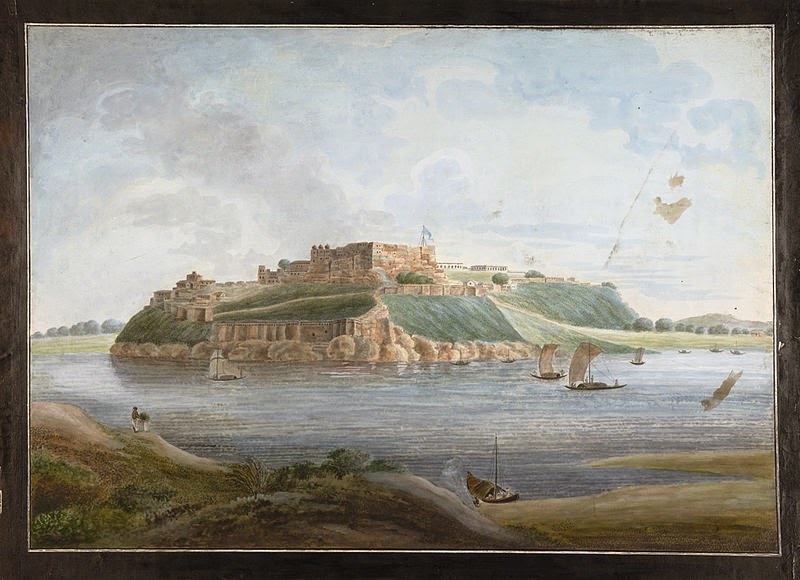 The fort with all its territory was formally ceded under a treaty to the East India Company in 1768. For some years, the fort was the main artillery and ammunition depot of the Northwestern Provinces. 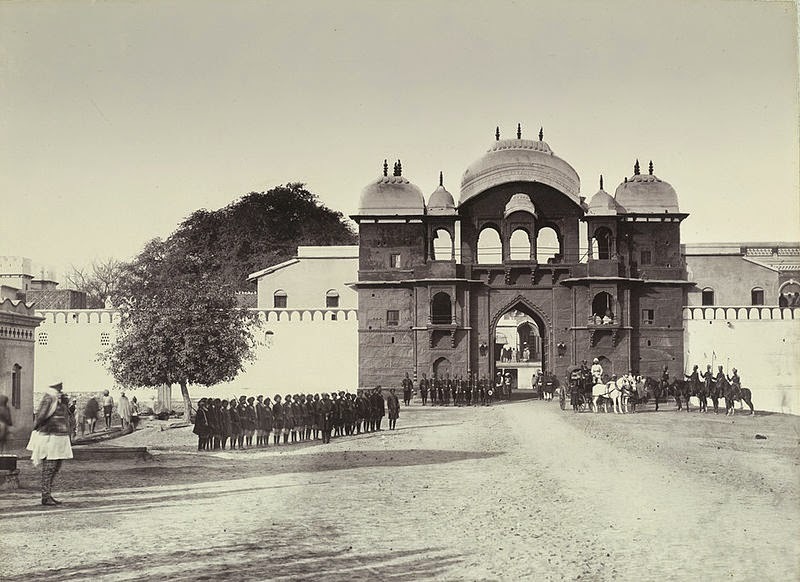 Maharaja Chet Singh had taken possession of the fort temporarily but was evicted. 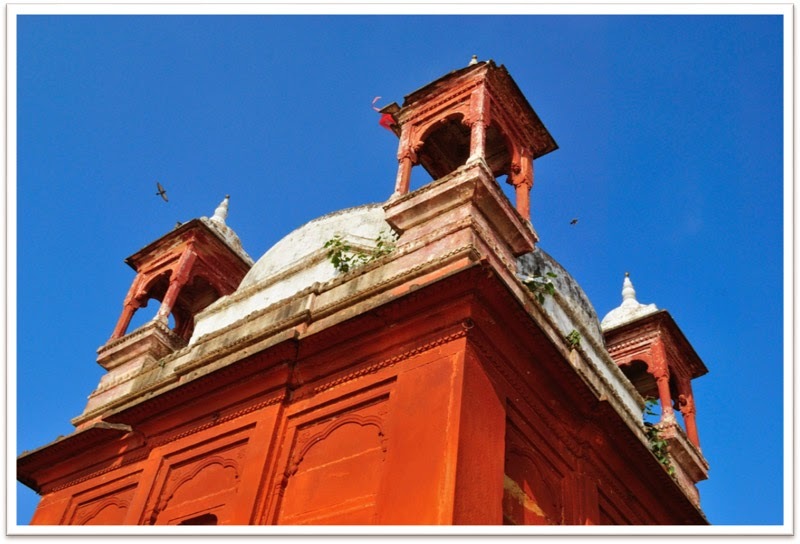 In 1781, he raised a rebellion in Varanasi and near the villages around the fort when Warren Hastings, the first Governor-General of India (1773 to 1784) took shelter in the Chunar Fort. 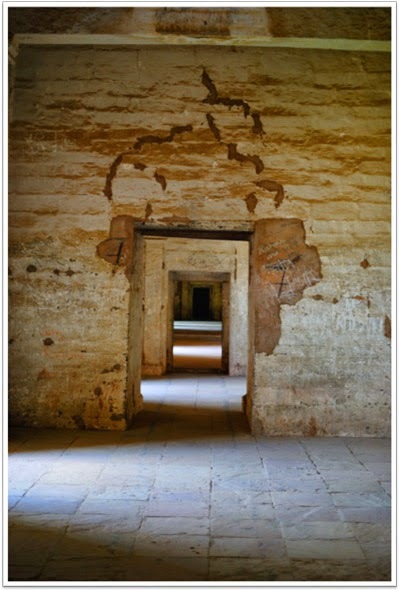 In 1791, Chunar Fort became the headquarters of an invalid battalion of European and Indian troops serving in India; those officers and men who were considered medically unsuitable for field duty were shifted to this fort and given light duty. 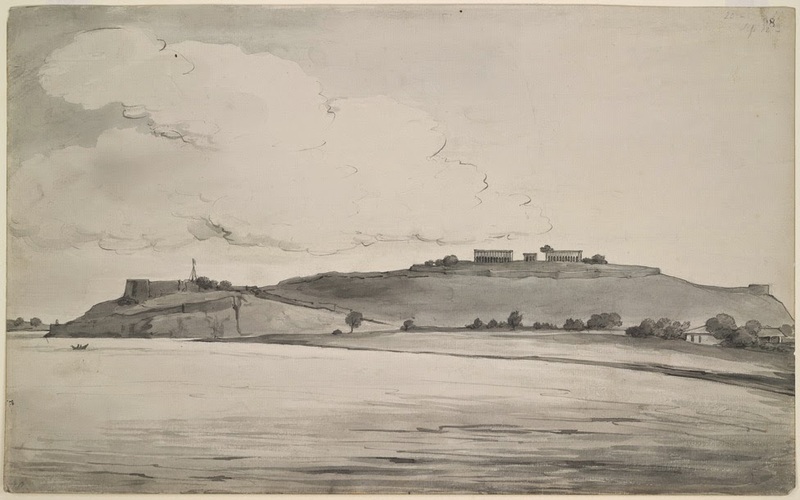 From 1815, the fort also housed the state prisoners. 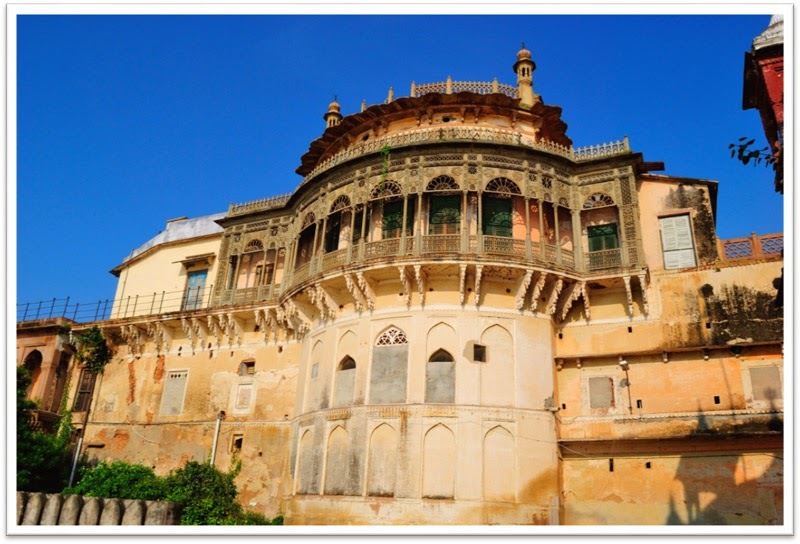 In India's first Freedom struggle, also known as Sepoy Mutiny of 1857-58, the fort was the safe ground of the artillery and infantry company of the European invalid Battalion and all also to the officers and European residents of the district. 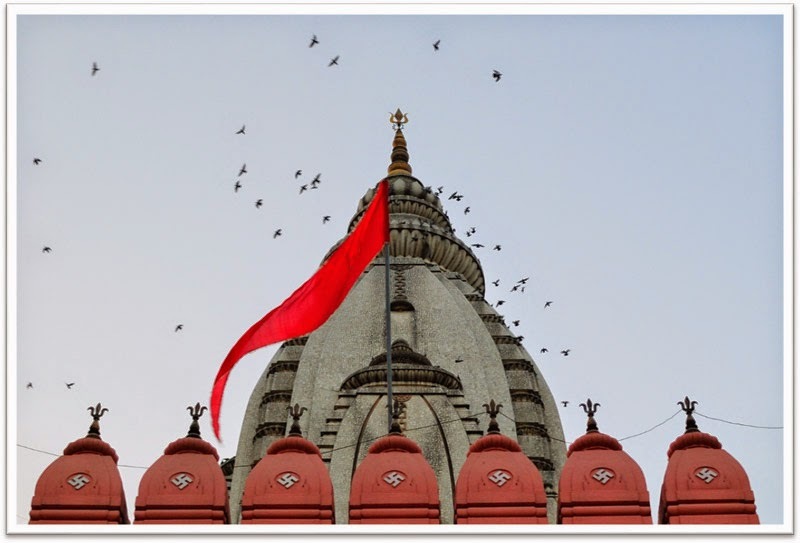 The Bhartri Nath's shrine here was also used for some time as the civil treasury. After 1890, troops were withdrawn from the fort. 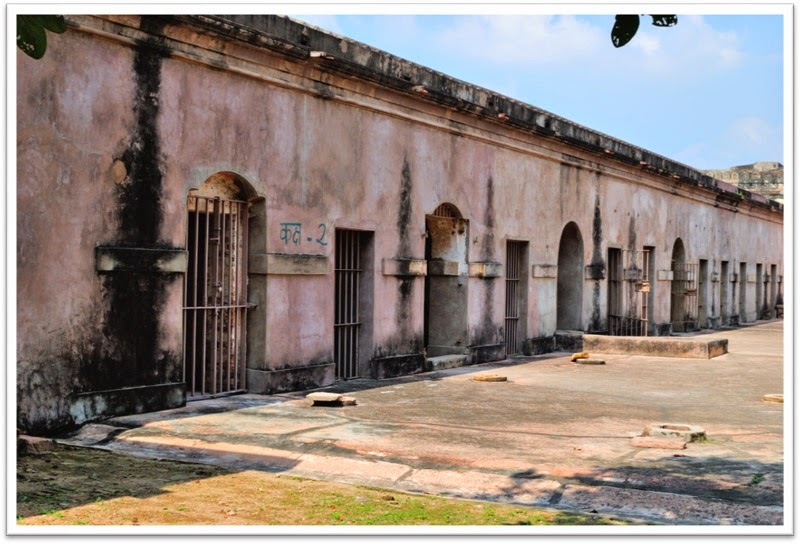 The building's complex within the fort became the property of the civil administration who used this place as a convalescent jail. Subsequently, it became a religious centre. Currently the fort is used by UP Police as a training centre thus you need to register your name at the entry gate. 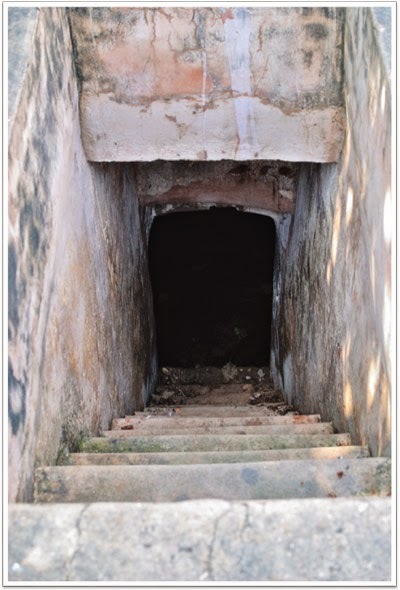 This means that only some portions of the fort is accessible to tourists whereas rest is beyond access since its used by the UP police to train special forces. The only thing that we were not allowed was the Sun Dial which I had photographed many years back since this portion was now converted into residential quarters for the trainees. Chunar is famous for bone china products and you will surely find many shops selling cups and saucers. These are all locally made and surely recommended. I personally have a tea set which I had purchased nearly a decade back and only use it during special occasions. Make sure you bargain before you buy something. On our way back we stopped at Chunar station and had some tea and biscuits. The walk back to the Chunar bus stand was long and by now it was 1 PM and sun at its peak. At the bust station we waited for couple of minutes and no buses were in sight. Our next option was to use the service of Tata Magic mini vans. We stopped one of them and it was already full finding no space we asked him to go ahead but to our surprise the driver shoved few of them outside the van so as to hang on the guard railing and made space for us. It was hot stuffy and smelly but since we had no option we did not complain. These van run quite slow and took nearly one and a half hour to reach Ramnagar. We decided to have lunch at Ramnagar and found a small hotel serving food right outside the entrance of Ramnagar fort. For 120 Rs we had Palak Paneer, Rice, Chola and a Mixed Vegetable. 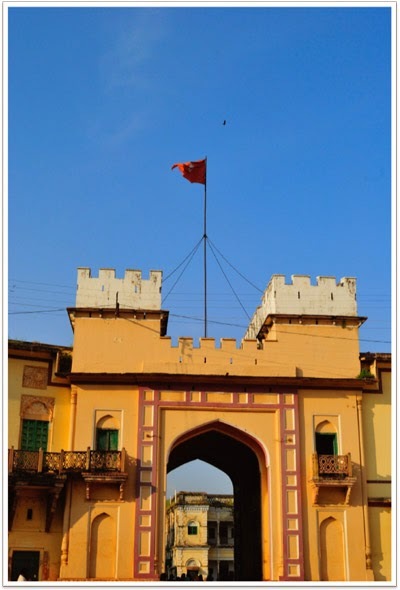 The Ramnagar Fort is a fortification in Ramnagar, Varanasi, India. 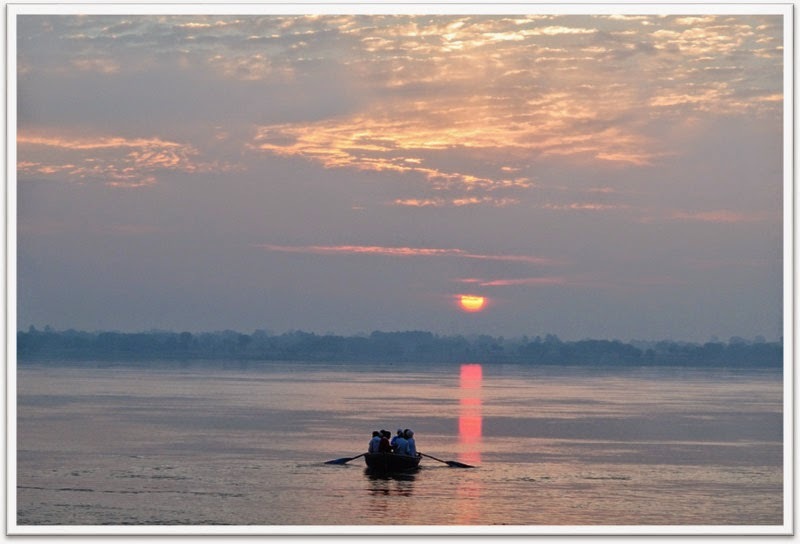 It is located near the Ganges River on its eastern bank, opposite to the Tulsi Ghat. 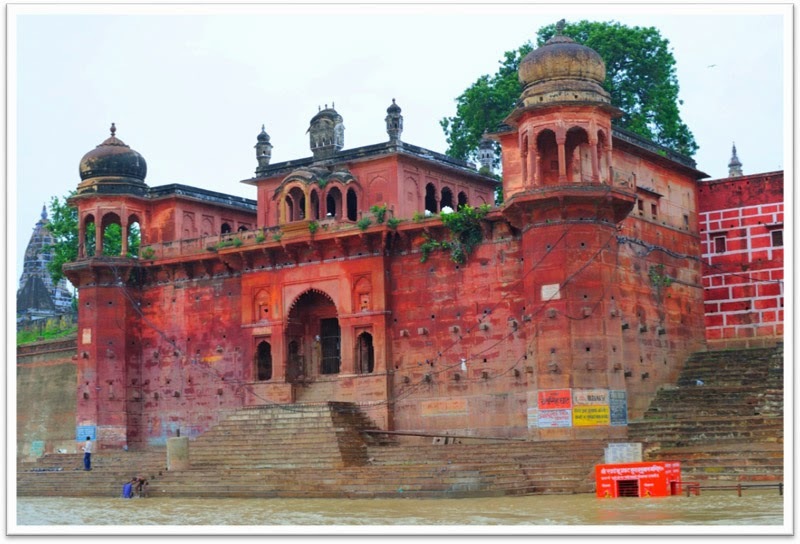 The structure was built in 1750 by Kashi Naresh Raja Balwant Singh with cream coloured chunar sandstone. 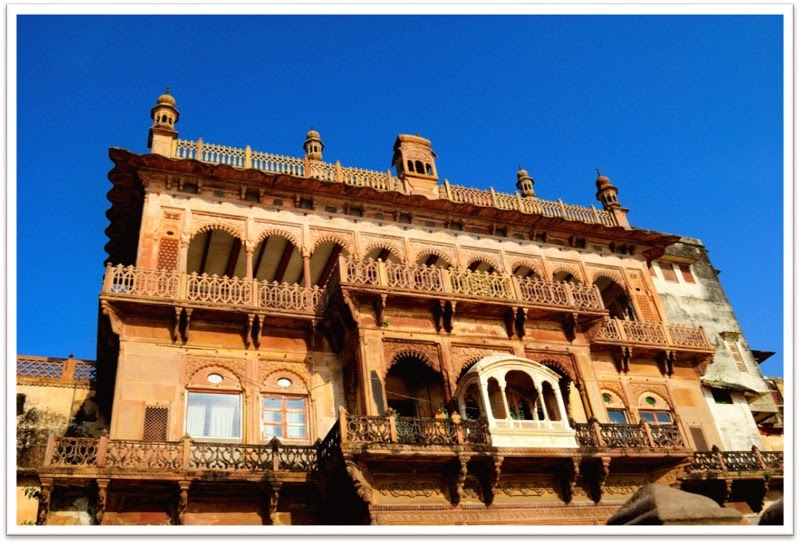 It is in typical Mughal style of architecture with carved balconies, open courtyards, and pavilions. At present, the fort is not in a good shape. 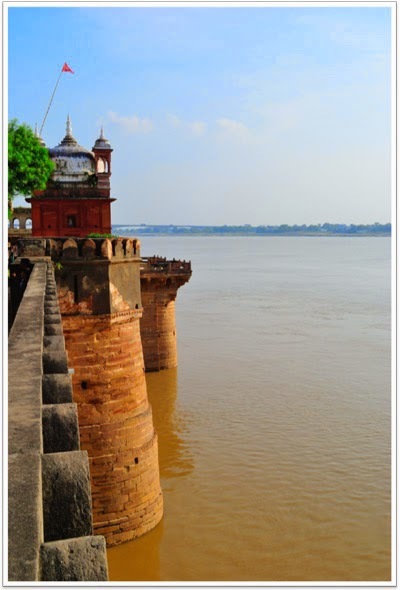 The fort and its museum are the repository of the history of the kings of Benares. 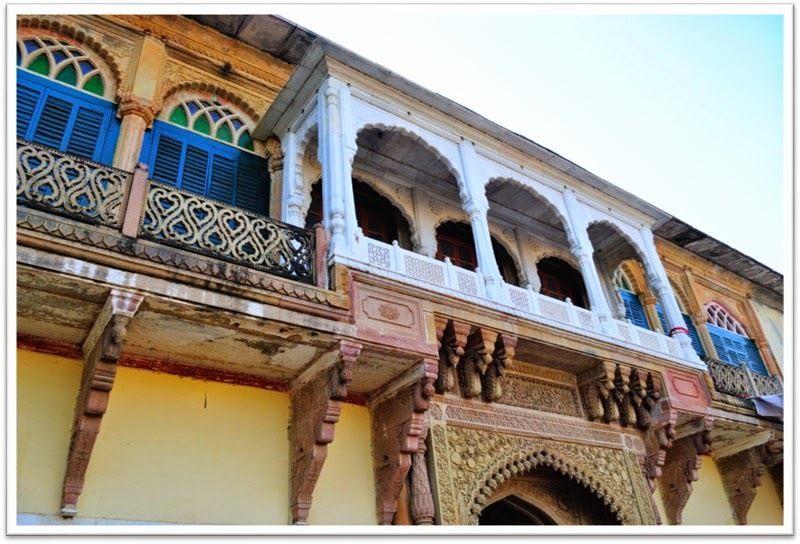 It has been the home of Kashi Naresh since the eighteenth century. 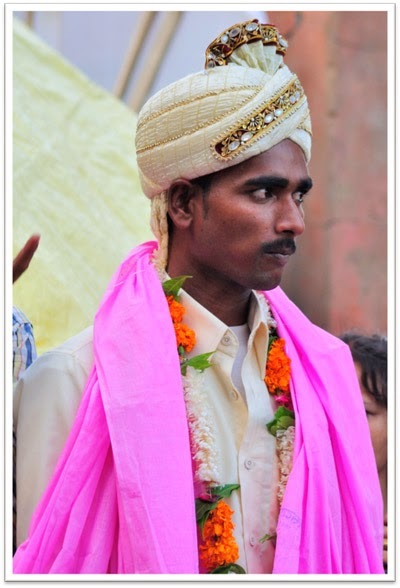 The current king and the resident of the fort is Anant Narayan Singh, who is also known as the Maharaja of Varanasi even though this royal title has been abolished since 1971. 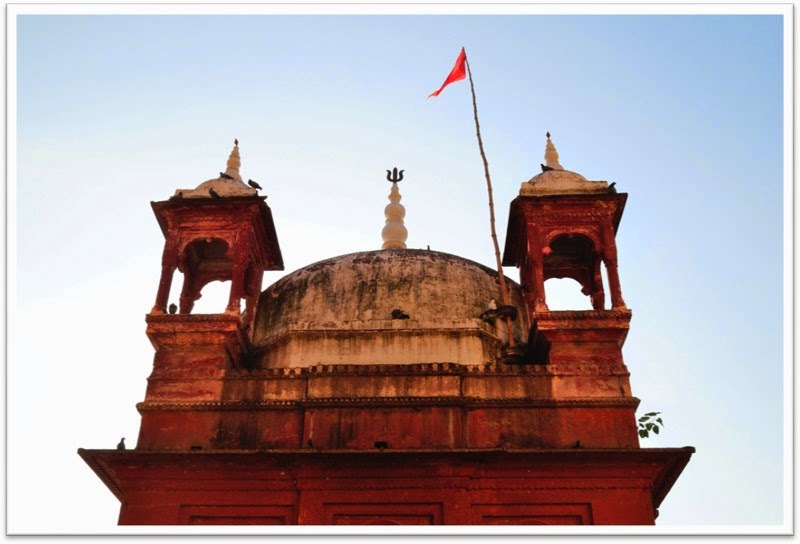 As you enter the fort from the main gate known as Laal Darwaza you will see the ticket counter to the museum. Tickets are 10 Rs if I recollect correctly and photography is not permitted inside the museum. The museum has some display of weapons like swords, muskets and revolvers from the past. You will be able to see various cars and Palkis (palanquins)*used by the royals. Once outside the museum you can enter the main fort area. One thing is to be noted here that the Maharajas family still resides in the premises thus you are not allowed to roam freely. Movement is restricted only in some portions of the fort. You will have a chance to see old photographs of the Maharaja with various dignitaries. There was one photograph of Haile Selassie with the maharaja which struck me. 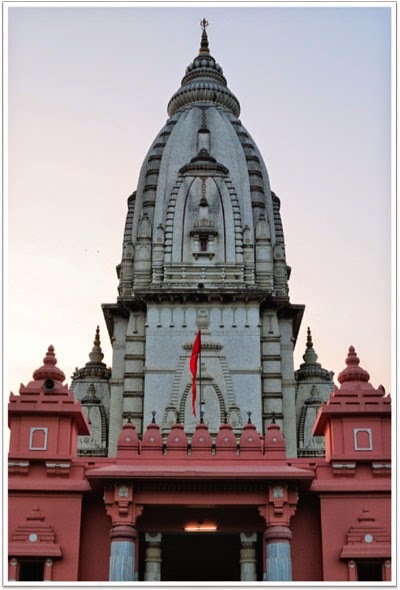 There is a temple at the premise just overlooking the Gages, being on the opposite side of the main Varanasi city you can get a good view of the city from there. Even though we were tired we still had some energy left in us and we decided to head towards BHU (Benaras Hindu University) Campus. 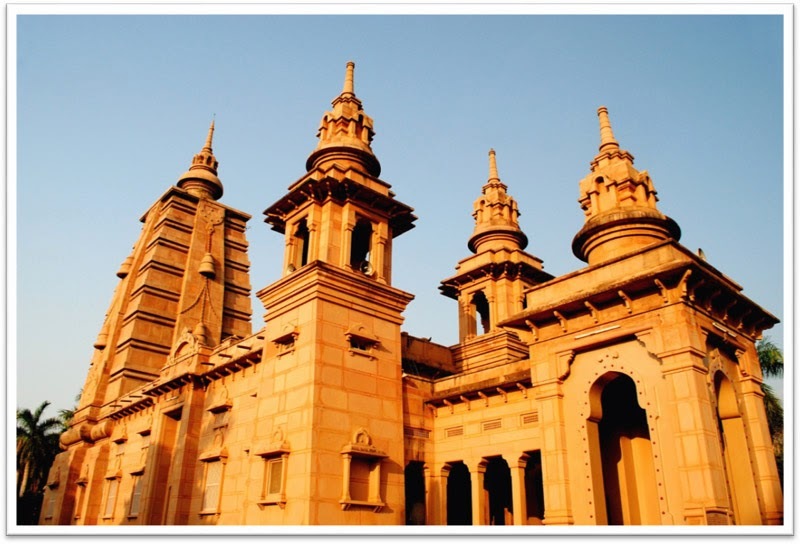 Inside the main campus there is a Vishwanath Temple which was built by the Birla?s and this being the centre of the university campus has many eateries and curio shops. It took 120 Rs. To book an entire Auto from Ramnagar Fort to Lanka Gate and from there we took Cycle Rickshaw 20 Rs. Per rickshaw to reach VT (as it?s known locally). It was around 5 PM that we reached VT and the sun was already setting. This gave us an opportunity to do some bit of photography with my 35 MM 1.8 G. When you enter the temple compound you have to deposit your shoes / slippers at a special counter. The temple is not that spectacular but still worth visiting. We relaxed at the gardens of VT and this was really needed since we were really tired. Outside VT there are hundreds of shops selling various food items. We has Banana Milk Shake which was real heavenly. BHU is really having a soft corner in my heart since this is where my wife used to study her Masters. I used to meet her here at VT and used to have the same Banana Milk Shake. The taste has not changed by the age has changed. I gave my wife a call and she was real nostalgic about it. She requested me to bring some junk jewellery from VT curio shops which I obliged since I have to return back to my house and that would be my entry permitJ. We took rickshaw back from VT to Lanka gate ad as usual costed us 20 Rs. We decided to pack Dinner and the choices are numerous. We took Tandoori Rotis and Grilled Chicken (Whole). 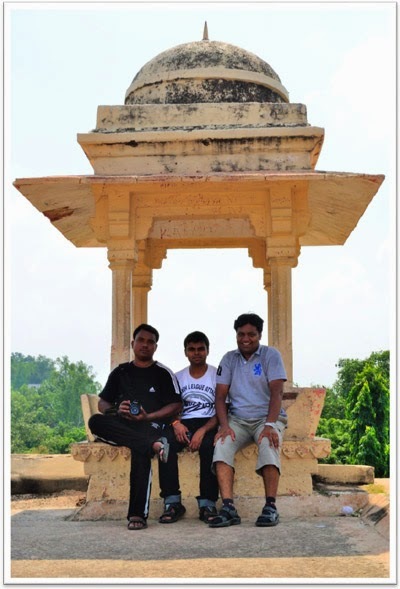 Approximate cost was around Rs.500 for all three of us which comes to Rs. 166 per person. Today we were really tired and sleep came real quick. 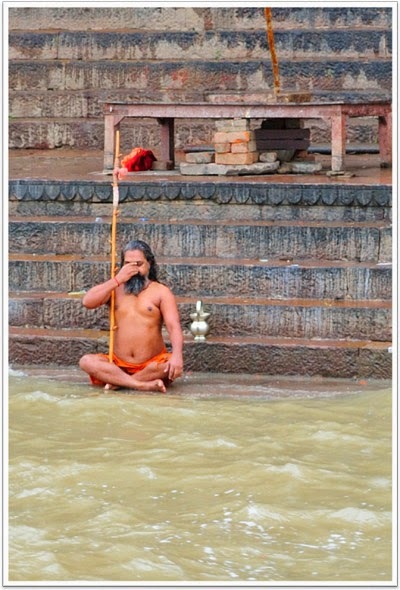 Next day we got up early and to our horror is was raining so our early morning trip to the Ghaats was cancelled. We had our usual breakfast of Puri Sabzi and hot Jalebis. 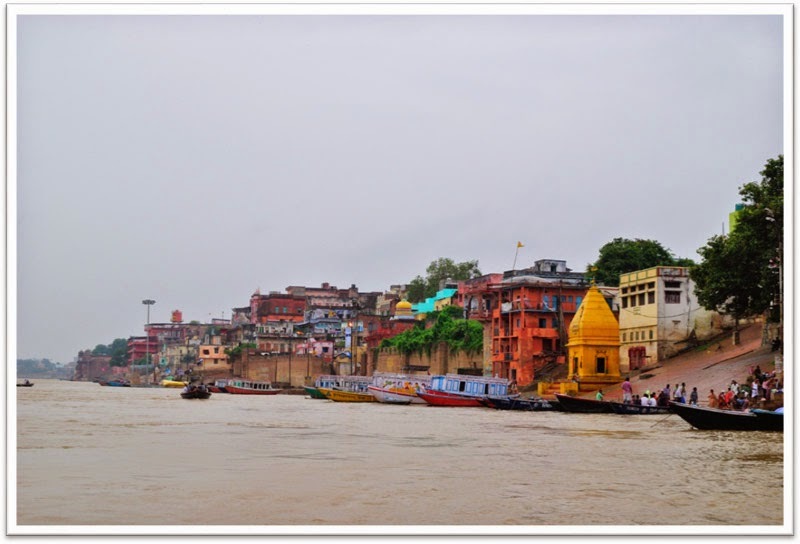 By this time the drizzling had stopped a bit and we decided to go for boat ride on the Ganges. We negotiated for 180 Rs for a round trip from Assi Ghat to Dasaswamedh Ghat and back. I had taken many similar rides before but this was different since the sky was overcast and there were slight drizzle sometime. Not much to photograph but still Varanasi never disappoints you get something or the other. Our plan was to go and explore the city life of Varanasi by walking in the lanes and by lanes doing some street photography but with this kind of weather it was not possible. With nothing else to do we went to BHU campus and saw the Durga Puja celebration inside the campus. We had out lunch at VT and went back to our guest house to freshen up and prepare our journey back home. We had the 5 PM Doon Express from Varanasi to Kolkata. The train was expected to reach Kolkata 8 AM the next morning and we had the full day to rest since being Vijaya Dasami we had holiday in our office. We left the guest house at around 3.30 PM and reached Varanasi Cant station by 4.15 PM. Dinesh purchased half a dozen apples (this purchase was very critical, read further to know why) and two bottles of water (1 Lt X 2). The train was 15 minutes late and reached Varanasi at around 5.15 PM and departed with 10 minutes. Trains from Varanasi if going towards Kolkata always crosses the Ganges and we saw the city for the last time. The train took speed and reached Mughal Sarai Jn in time. Our initial plan was to pick up dinner from Mughal Sarai but then again we changed our plan since we did not plan to have early dinner. This was a BIG BIG mistake which became the highlight of the trip. If you Google ?Cyclone Phalin? 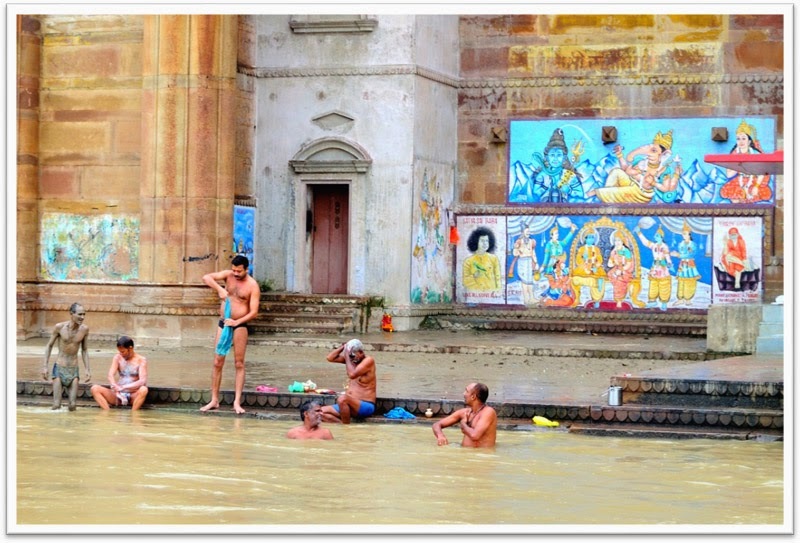 you will know that the rain that we were facing in Varanasi the last day was due to that Cyclone in the Bay of Bengal. There was a mass evacuation in the coastal areas and the government was preparing for something really dramatic. Now coming back to our return journey, after one hour from Mughal Sarai the train suddenly comes to a halt in the middle of nowhere. By now the weather had turned pretty bad and the drizzle had turned into heavy rains. After waiting for a 3 ? 4 hour new came that due to the severe weather there was damage to rail overhead power and the train cannot move ahead till it?s repaired. Now here comes the tricky part, we were in the absolute last coach of the train. Even so that the guards coach was in front of us. Our coach had no vestibule doors in the end section and we could see the train track behind us. This also meant that some of the rain water lashed inside the compartment. Much worse was yet to come sine Bakri Id was near so one gentleman had boarded the compartment from Mughal Sarai with 3 Goats. Yes you have heard that correctly I really mean 3 huge goats. The train was stuck and we started feeling hungry, we looked outside the window and it was complete pitch darkness. Dinesh was a savior we ate the apples that he had purchased at Varanasi and rationed the 2 Lt of water that we had. The apples were really small in size and really did not fill our stomach but we had nothing to complain since there were others with no food. By now it was 11 PM and we decided to sleep off but sleep did not come since we were more interested in the update about the train?s departure. The goats added to the problems, goats stink I mean they really stink and the three goats added to the problem. Night turned into morning and we saw the dawn breaking from the open connecting door of our compartment. Dinesh and Prosanto went out and saw few houses in the distance, this means there was village nearby and that in turn means that there has to be some shop. They could manage to buy some biscuits of various brand name and none of them were known to us. There was a tube well also and they were used to fill up the empty bottles. The train finally reach Howrah at 9 PM that very day and after jostling through the pre paid cab line finally reached back home at around 10.30 PM. What a trip that I had... I mean what a train journey it was. Somehow i missed this post earlier.. Beautiful photos and equally entertaining write up..